Our attention has been drawn to media reports concerning the activities of Prophet Francis Taiwo, Shepherd in Charge, Celestial Church of Christ ( C.C.C ), Key of Joy Parish, Ajiwo at Ajibawo in Ado Odo/Ota local government area of Ogun State. Prophet Francis Taiwo was reported to have chained his nine year old son and starved him of food for months, after the boy was accused of habitual stealing. The nine year old boy was eventually rescued by men of the NSCDC who stormed the church premises for that purpose. Latest reports indicate that the culprit, Prophet Francis Taiwo was later arrested by the police with the help of his church members. This report has drawn the ire of the public and our great church has been receiving undeserved flaks therefrom. We are thus compelled to issue this statement to correct whatever misconceptions must have been created about the church, in the minds of the general public, by this shameful and totally unacceptable incident. Let it be known that the Celestial Church of Christ does not condone child abuse and violence of any form. We recognise and place a high value on our youths and children as we often acknowledge them as the salt of the earth and a vital part of the future of any organisation, church or nation. Our belief is that children therefore must be raised in an atmosphere of love, Christian values and reasonable parental discipline. 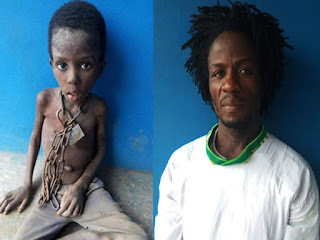 The fact that the said Prophet Francis Taiwo was arrested by the Police with the help of his church members lends credence to the fact that our church abhors child abuse, domestic violence and inhumanity of any form. We commend the NSCDC and the Nigerian Police for a job well done, and wish to assure the general public that the Celestial Church of Christ is already looking into the matter and would mete out appropriate disciplinary actions on the culprits. Thank you and may the Lord be with you all.